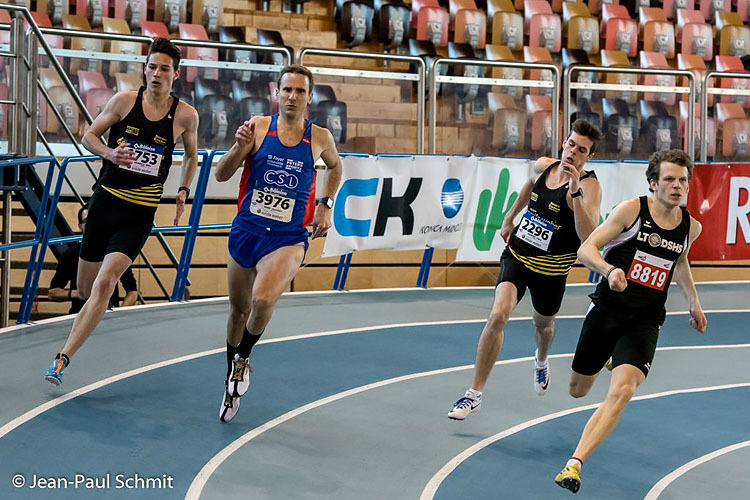 Sometime in April, my club asked me if I could join them in Portugal for the European Champion Clubs Club on the 100m and 4x100m. 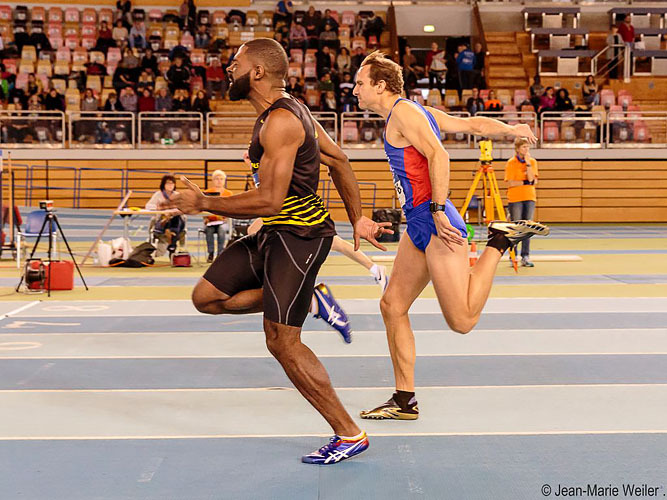 At 38 years old, I didn’t consider myself the strongest sprinter for that task, but their options (not that many 100m sprinters, studies, injuries, people not having the Luxembourgish nationality, etc.) were limited. 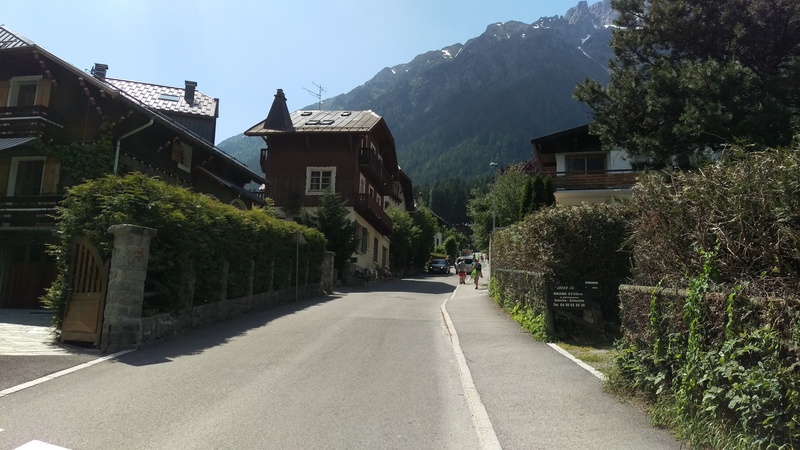 I had wanted to concentrate on vertical kilometer training in spring, but when offered the chance to travel to a country I’ve never competed in for the club I’ve been a member of since 1987, I could hardly say no. 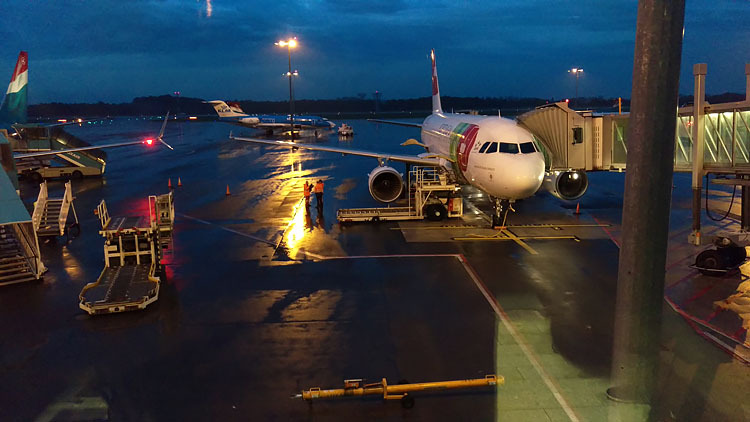 So on May 27th the entire group took an early-morning flight on TAP from Luxembourg to Lissabon, and then spend another couple of hours in a minibus to drive down to Leiria. 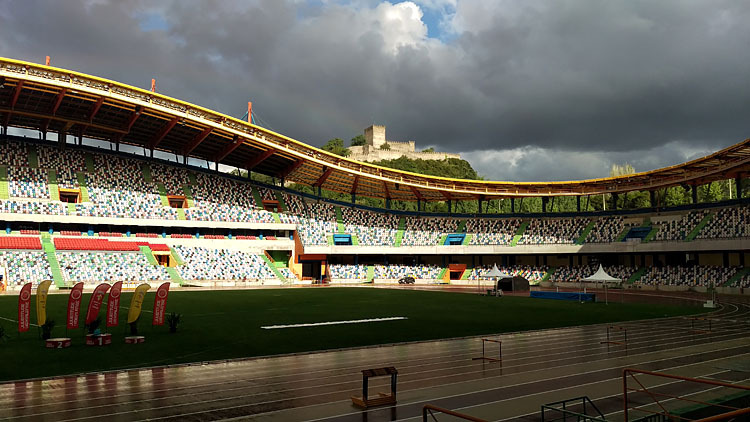 In the late afternoon, most people headed down to the track, where we were first hit by rain and then witnessed nice evening colors on Leiria castle that towers over the stadium. After a decent night’s sleep in our hotel “Eurosol Leiria” (in which a third bed had been added to a regular two-person bedroom barely large enough for that task) and good hotel breakfast (the only decent food we had while in Portugal – the event catering offered by the organizing club was not very good), we headed out for the events. 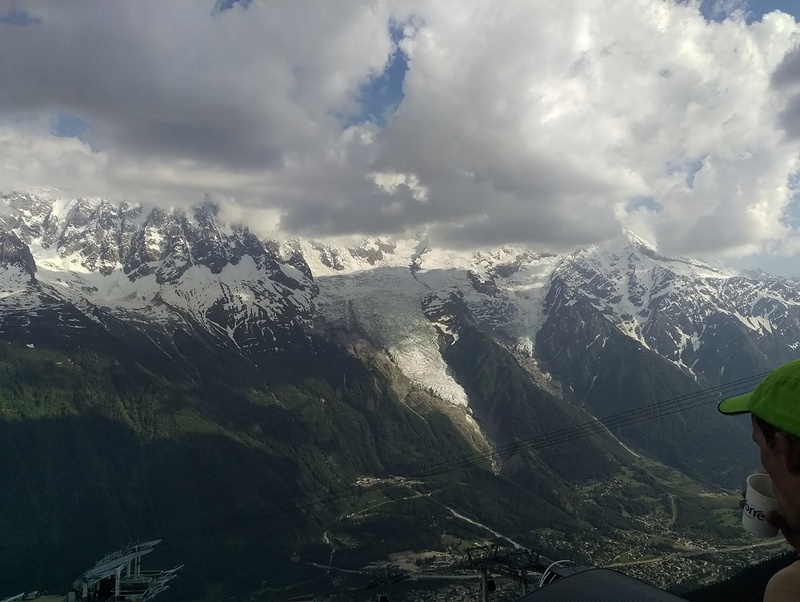 The rain had passed and temperatures were climbing. No excuses, then. Well, my 100m was bad. My start was a textbook example of what not to do (it felt like I stood up and ran). And to add insult to injury, I was competing against athletes that were faster than what we see in national or regional competitions. My series was won in 10″51, and I came in dead last in a disappointing 11″91. The fact that I was the only competitor marked as “masters” in the results list, and that we had a -1.2m/s headwind were not much of a solace. Later that day, we still had to do a 4x100m. And again, we were up against strong competition. Not to mention that our team was compromised of a triple jumper, a javelin thrower, a high jumper who’d also done a long distance that day; and me, the old guy well past his prime. During warm-up, it became evident that the meeting organizers had some kind of trouble. We had already finished our warm-up and were waiting to be let into the calling room when… nothing happened. This would ultimately last for close to an hour, during which we weren’t even allowed on the track to maintain our warm-up. 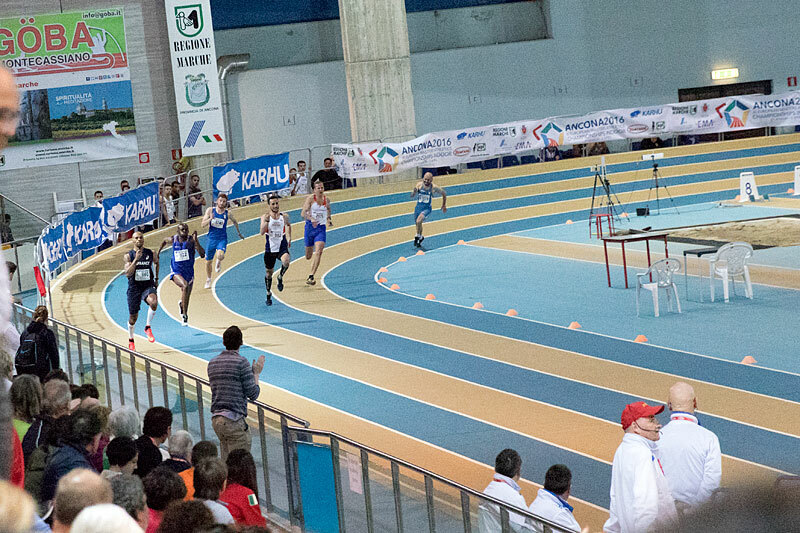 Finally, the first heat was allowed onto the track, and ran their race. 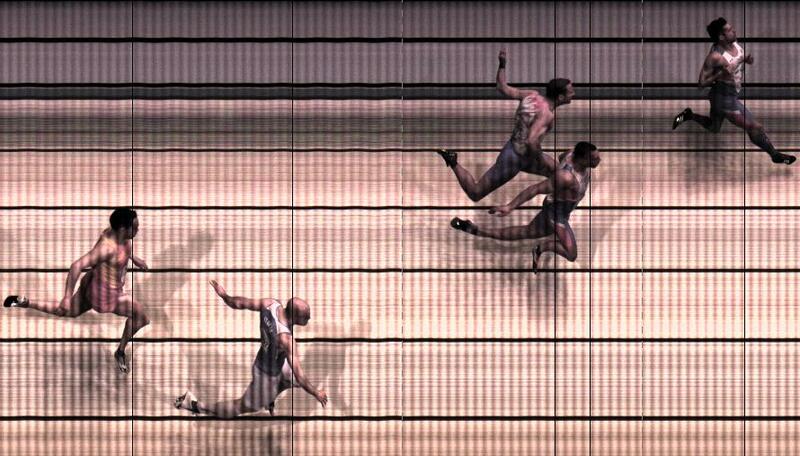 I noticed that the race marshals didn’t even catch a very obvious mistake by one of the competitors (he stood with his entire body in front of the line that marks the start of the 10m acceleration zone, rather than inside it) that should have lead to outright disqualification of the offending team. In our heat, we finished last. The time was a disappointing 45″44. Mind, I’m not slagging the team – we did as best as we could, and everyone gave his best given the circumstances. It’s just that it was disheartening to see several other teams do times between 43″ and 44″, which should really have been within reach for the club. 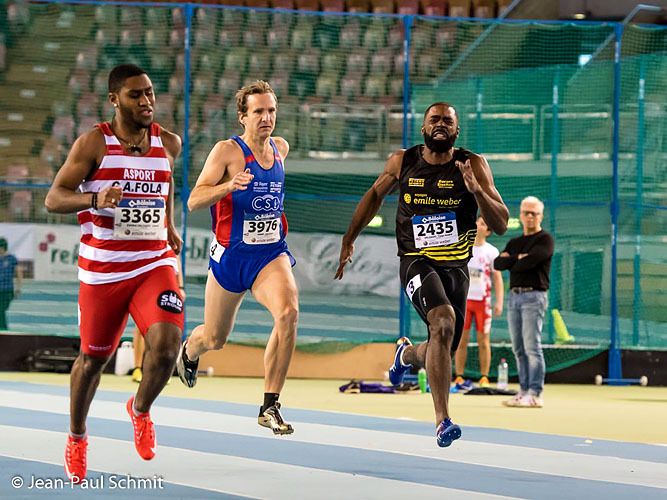 When the entry lists for the EMACI first appeared online in early March, it looked like my best chance to go on to the next round (half-finals) was in the 200m. 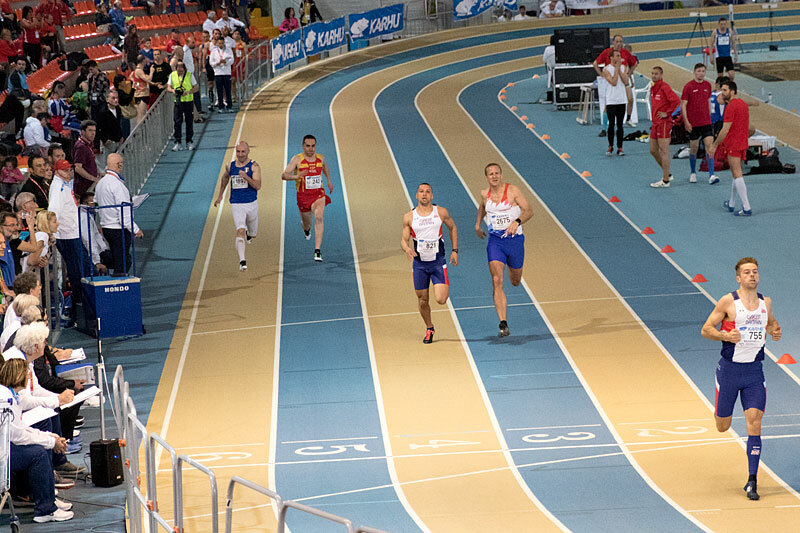 As it turns out, the number of athletes in attendance and my own performances at the 60m series allowed me to progress to that half-final as well. I’m not complaining, of course, but given my less than optimal preparation (only getting green-lighted for competitions in late December after six months off due to an Achilles injury), running two 60m’s on Tuesday instead of one meant additional stress on my body, and by the time Thursday rolled around I wasn’t feeling fully recovered. Once again, I warmed up on the outside track. Temperatures were manageable, but there was a very strong wind. I did my usual warm-up, plus some strides and starting blocks in the turn, trying to ignore a building unease in my left foot and Achilles tendon. About ten minutes before the calling room opened for the M35 category, I headed back inside. The atmosphere inside was stuffy. The air conditioning that had been going full blast the first day had had been shut off. Combined with fairly full stands this meant that the air quality suffered a lot. I had been assigned lane #3 in heat 2. 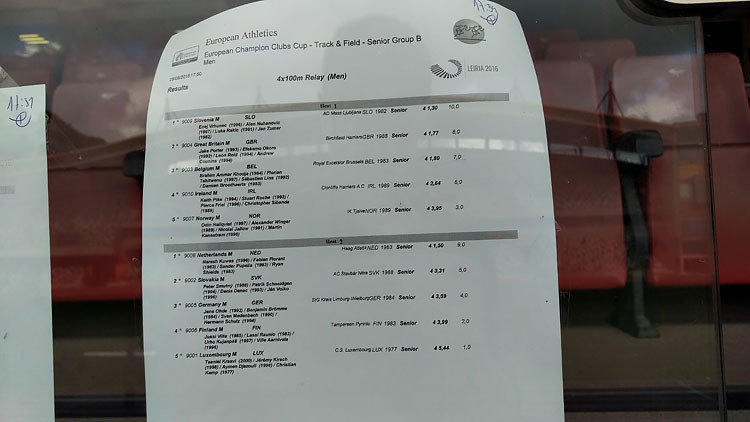 With five heats in total, the first two athletes in each heat and the eight best times after that would go on to the half-finals. I knew that Richard Beardsell had a much faster season best, so he was certain to qualify, which meant that if I wanted to be sure to advance I needed to place ahead of the others. The gun went off and I pushed out of the blocks. My start had been mediocre – I’d seen worse, but the acceleration into the first bend maybe wasn’t as aggressive as it could have been. Richard in lane #2 went past, and in turn I tried to get closer to Marvin Edwards in lane #4. The straight lines in Ancona seem quite long and the bends are quite narrow; which at almost 1.90m tall doesn’t suit me terribly well. Still, as we exited the second bend I was within breathing distance to Marvin and second place. However, there was still a long straight ahead until the finish line and I tried to push hard to inch ahead. 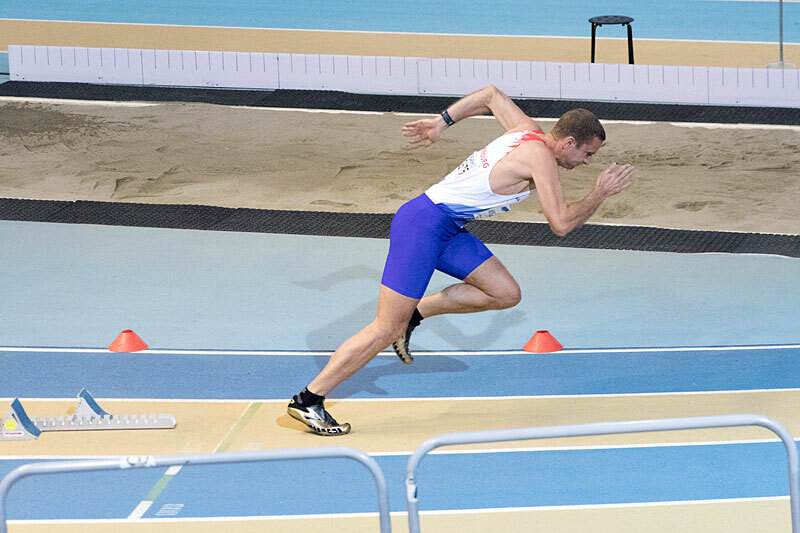 The trouble with pushing hard is that it’s not really elegant and just running a relaxed stride would have been better; but while you’re in the effort that’s a hard thing to influence. The final 50m seemed to be twice as long, and if the crowd was watching I hope we gave them a good show – it was a close fight for second position. Unfortunately for me, I lost it by 4 hundredth of a second. The time was quite bad, 22”86 versus 22”82, or over a second behind the winner (22”72). Across the finish line, I collapsed on the floor. I would later repeat that performance in the stands, because the air was still quite oppressive and I’d given a hundred percent. The good thing was that my performance would allow me to progress to the half-finals. My time placed me as 13th out of 18 half-finalists. 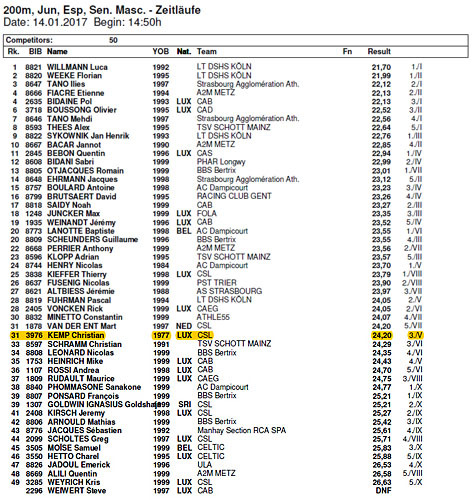 After running the qualifications around 15:00, it was once again a long wait until the half-finals that would take place close to 20:35. The logical choice would have been to head back to the hotel, but since ours was outside of Ancona it would have meant quite a drive and then the need to look for a parking spot again – things were quite busy on the roads and parking spots surrounding the area (although to Ancona’s credit, parking was free everywhere). I started my warm-up about an hour and twenty minutes before the race. It was still light enough outside so I didn’t have to jog, stretch or do strides in the busy and stuffy indoor area; but the price to pay for the fresh air was that it came in very strong and cold gusts. 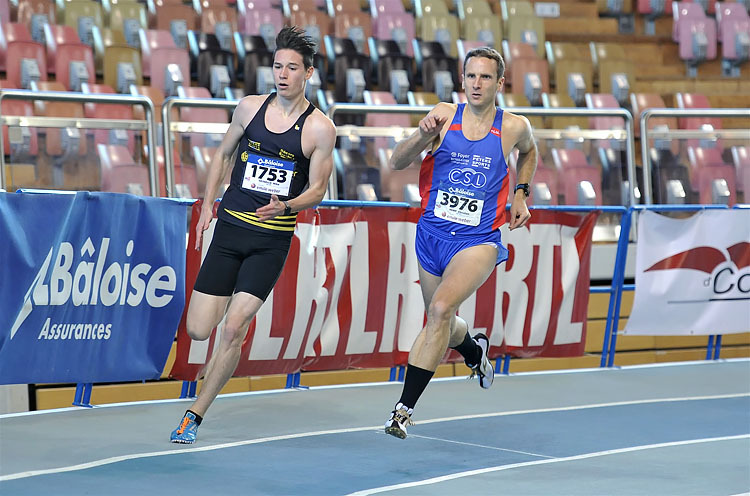 I retreated into the corner that was the most sheltered, and did an undisturbed warm-up – most athletes had opted to be less exposed to the elements and stayed off the outdoor track. 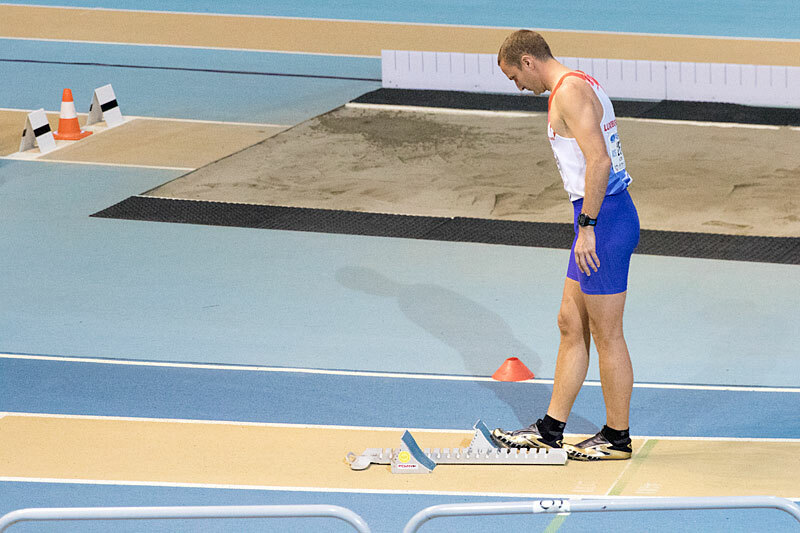 My Achilles wasn’t too happy – this week was the most I’d worn my spikes in years – but I was quite confident that it would hold up. About thirty minutes before the race, I headed back inside. Since the “official” way in was quite a bit of a walk, I followed a fellow athlete through a shortcut, a door marked “no exit / no entry” next to the calling room. We received a bit of a glare from an official, but nothing more. Once again the calling room staff (who didn’t seem to change too much, and were probably long hard days as volunteers) checked our bibs, whether we’d confirmed our races, and the length of our spikes. I was in the first of three finals, along with Jimmy Melfort from France who (spoilers!) would go on to win the final. Since I had one of the weaker times in the series, I was assigned lane #2. Again this didn’t make it easier to hit my ideal stride length during the turns, but the advantage was that I could see my competitors ahead of me. For the fourth time this week the gun went off. Again I tried to push out of the blocks aggressively, but again I found myself not making any headway against the stronger athletes. I’d told myself that I’d do my best to catch up with Gavin Stephens (who had qualified 4/10 of a second faster than me). Unfortunately, I wasn’t quite able to do that, and during the second turn I was fighting with Daniele Carloni for fourth position. 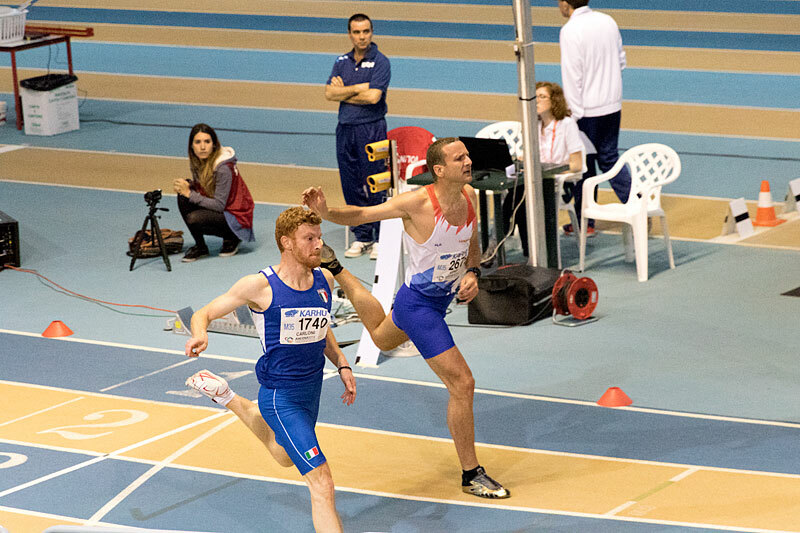 Once more, I came in four hundredths of a second short and crossed the finish line in fifth position in 23”82, to Daniele’s 23”78. 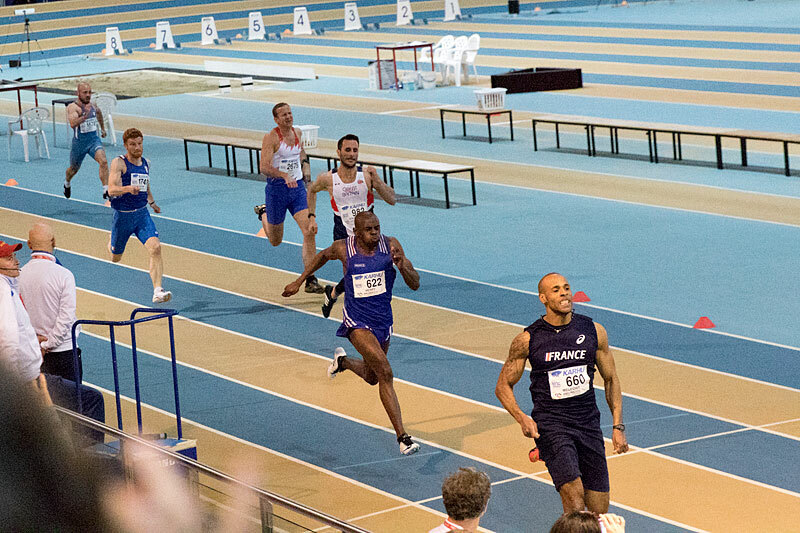 Gavin was third in 23”31, with the two French guys (Jimmy Melfort and Thierry Henry) well ahead. They would both qualify for the finals. 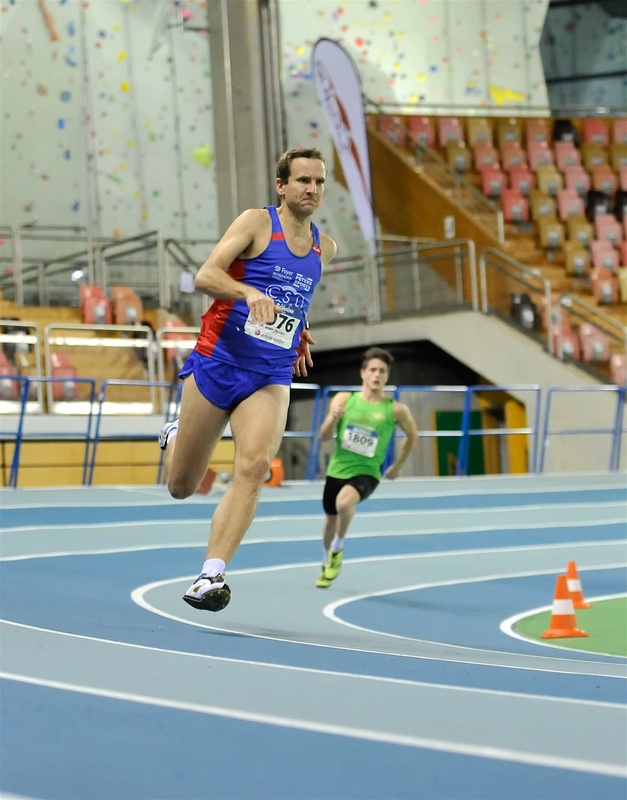 This time, I was a bit happier with my race execution – my final meters were less forced. However, of course the time still wasn’t great. There’s a multitude of reasons for that, some of which I’ve mentioned before: difficult recovery from my Achilles troubles, inability to train at the same level of intensity and volume that the other guys probably still do, etc. However, I’m happy enough with the general outcome of the week. 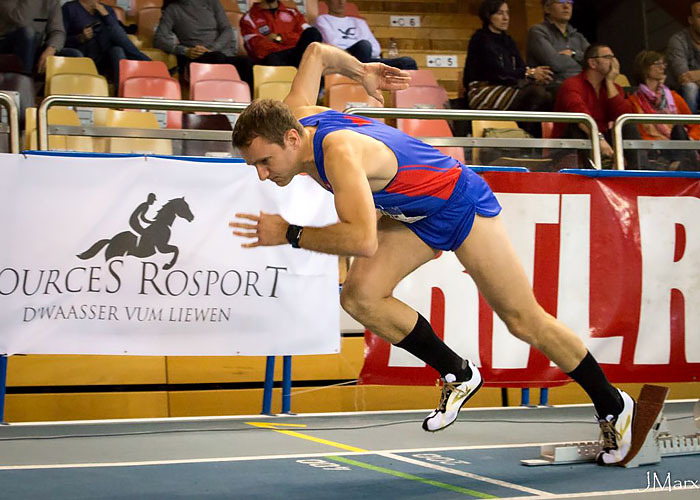 I didn’t injure myself; and I came close enough to my season bests (200m), or even bettered them (60m). Of course I would have liked to run faster or closer to what I still consider my remaining potential at 38 years old. But “it is what it is” and as such I can only be happy with the experience and having reached the half-finals each time. As for the 400m, for which I’d signed up as a “backup plan” in case I failed at my 60m or 200m, I wisely skipped that one on Saturday. All throughout the day leading up to my 60m series, I was doing mental mathematics: 14:36 minus 20 minutes call-room minus 1 hour warm-up equals the time I was supposed to start my warm-up. 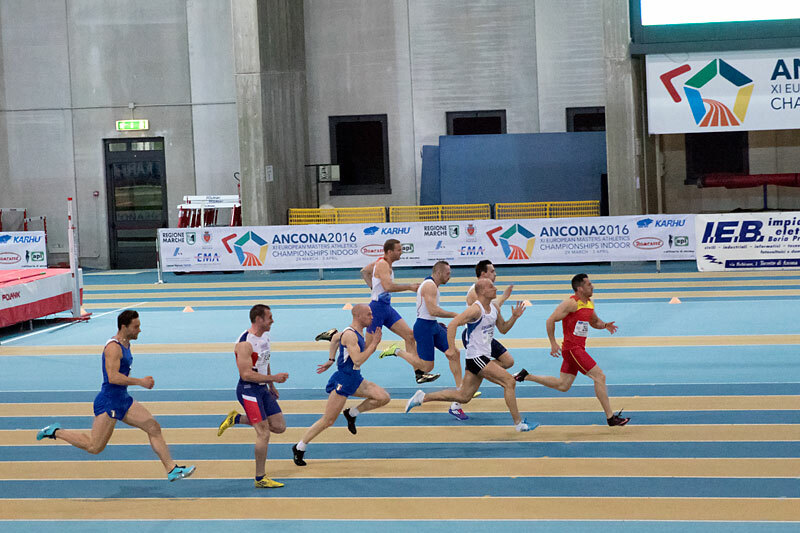 I checked my simple math several times, and still ended up starting several minutes early because this was my first big international track competition in over ten years, and with many athletes in different categories already warming up for their earlier starts, it was easy to get caught up in the excitement. 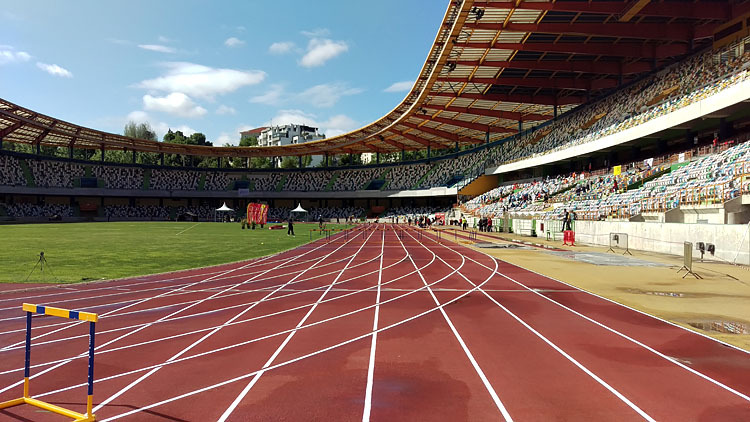 We’re in Italy, so some rules in the technical manual are cast aside straight away: nobody uses the dedicated warm-up area, a soccer pitch with artificial grass, and instead everyone is on the outdoor track where the throws events (javelin, hammer) are taking place. I run a few laps in the outside lanes, and then take shelter under a small structure near the finish line to do my stretching. The sun is beating down and even though there’s a cold breeze, it’s a great day outside. Since I don’t know any of the people I’m competing against, it’s hard to pick out who’s running in the same category: the M40 age group is running before my age group, M35 (for those aged 35 to 39), and there’s some overlap with some people starting their warm-up early while others might be late. I do skips and strides, then put on my sprint spikes. There’s two starting blocks on the 100m lane, then a third one appears and I head to the tool shed to grab a fourth one. 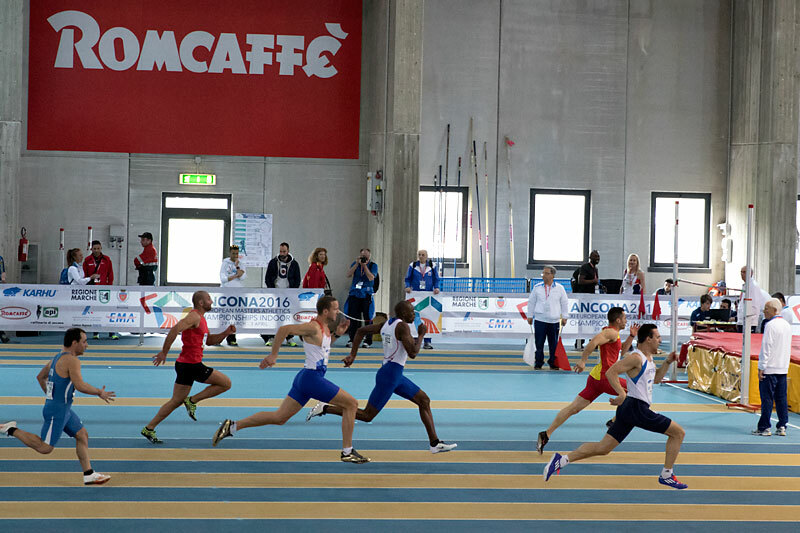 The atmosphere is relaxed, but at the same time it’s somewhat typical that the majority of sprinters are blocking out the entire outside world. The British sprinters are the only ones who talk among themselves. Their sign-up times are also among the best, so to them the series are just a mild inconvenience on the way to the half-finals and half-finals. For me, I was 28th out of 43 in the preliminary sign-ups, and as such I didn’t expect to be among the 16 who go on to the half-finals. 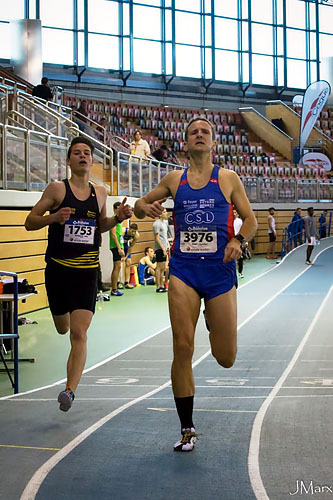 About 30 minutes before my race, I change back into running shoes and do the relatively long walk back to the indoor track and the calling room that’s located behind the second 200m curve. 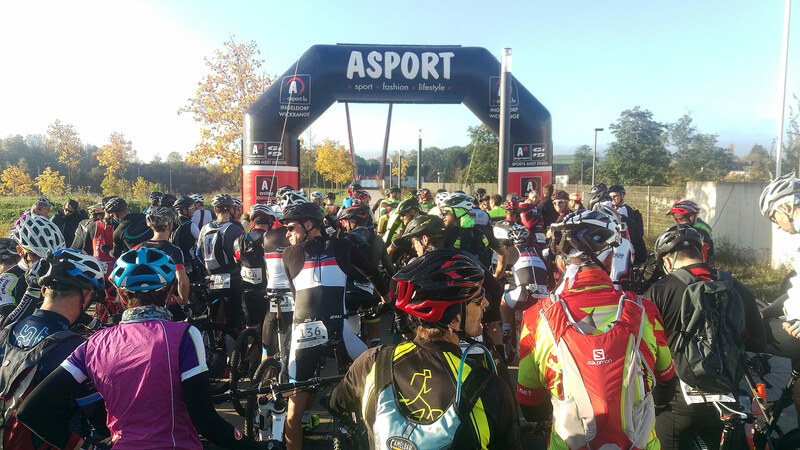 With around thirty to forty people competing in each of the age groups, there’s quite a crowd. 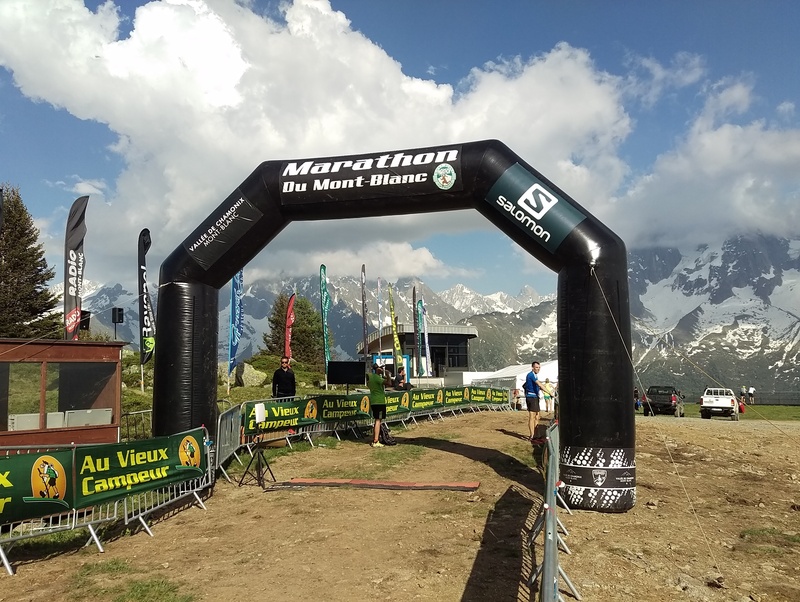 Things get slightly hectic as the M35 group is allowed into the calling room – the officials are briefly checking our accreditation badges, bib numbers on the front and back of our uniform and the conformity of our running spikes. We’re limited to a few chairs, since the M40 runners are also still waiting for their turn. Some jump around, do quick sprints bursts in the few meters of space, or just watch the preceding heats through the advertisement banners separating us from the track. My name is called along with the other people in the first heat and soon thereafter we’re led out onto the inside track. Everyone sets up their block and does a test start, then at around 14:40, almost fifteen minutes late, the gun goes off. My start is OK – not my best, not my worst. Surprisingly, I’m in lane four even though a lot of runners had faster times. 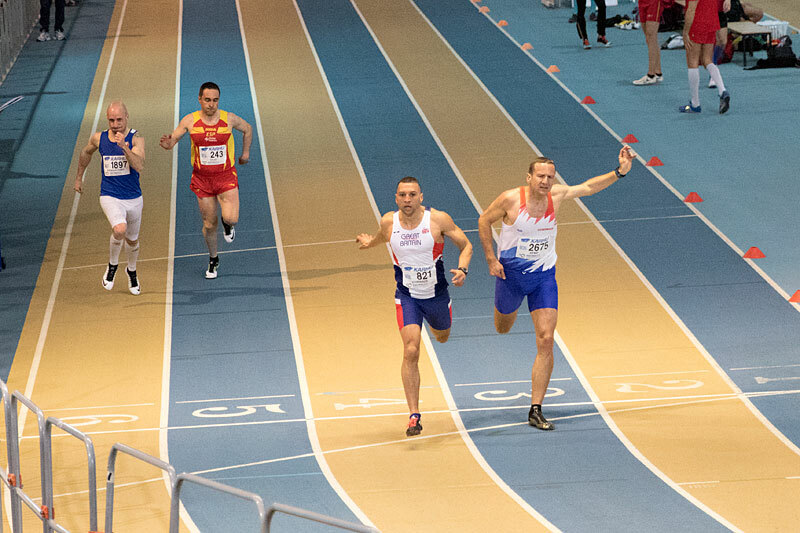 Lane four allows me a good view of my competitors as we sprint towards the finish line: there’s two people way in front (Sergio Cruz Pastor in 7”04, David Beaumont in 7”10), a third one also still ahead of me (Thierry Henry, 7”28), and then there’s me in fourth place. Only the first two of each series go straight through the half-finals, everyone else needs to battle it out for the handful of remaining spots. Hand-shakes are exchanged beyond the finish line, and we’re ushered out of the track so the next heat can stand. I motion “thumbs down” to my wife in the stands to let her know what my initial impression was of my time, and then return to the calling room to change back into running shoes. 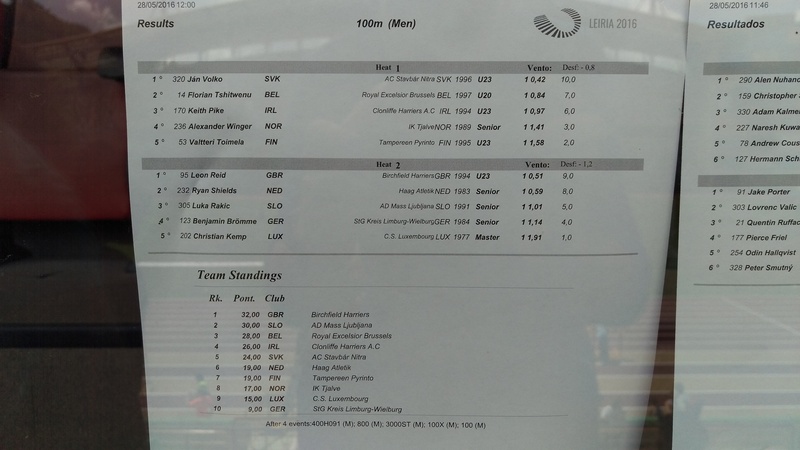 In the end, it turns out that I did qualify for the semi-finals, in 7”40. Only 34 people actually lined up at the starting line, and of those 34 I had the 14th-best time. However, the margin was razor-thin, the two people slower than me both did 7”41. Maybe of note is that out of 16 people, only two were born in 1976 and thus older than me, I was the only one from 1977 and the majority of my competitors were born in 1978, 1979 or 1980. 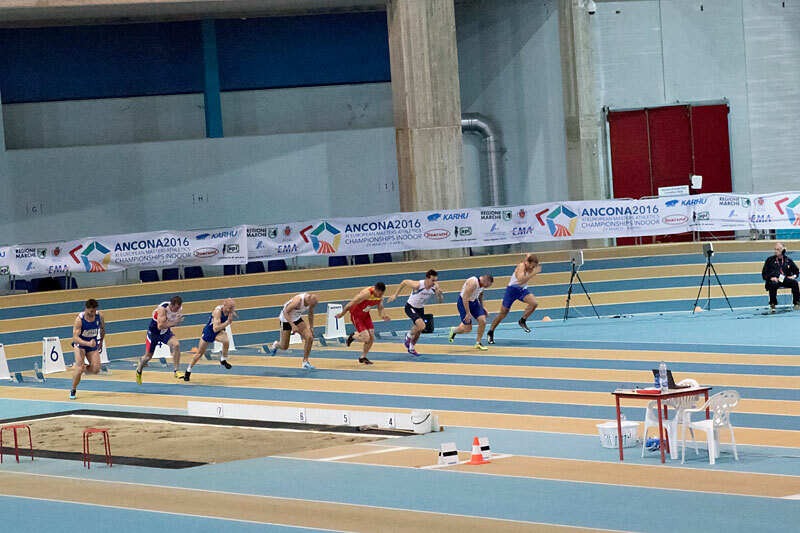 With the (surprising) semi-final qualification, I’d need to run a second 60m in the evening. My heat was at 14:40, the semi-final would be six hours later at 20:40. 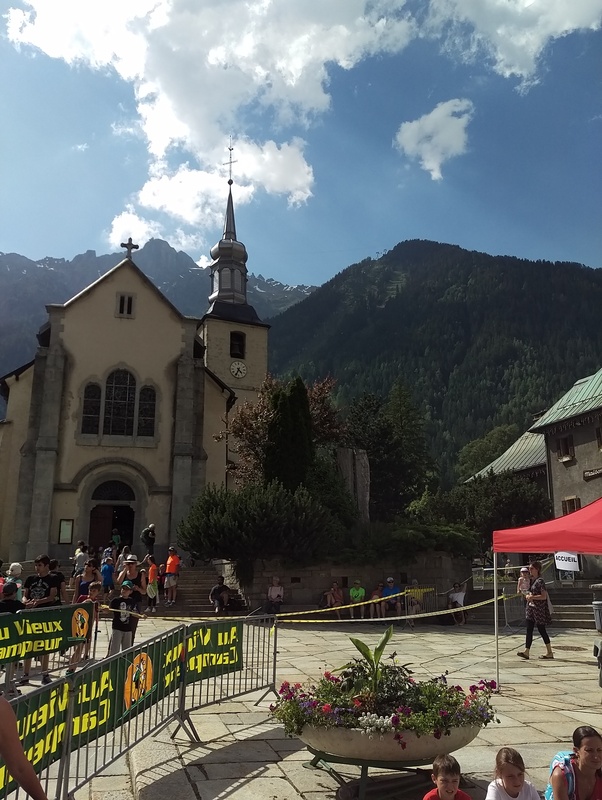 I had already done a cool-down lap and a little bit of stretching after the 60m, so I joined my wife in the stands and we headed outside to grab a bite to eat. There were sandwiches and small pizzas, so I had one each and treated myself to a can of Coke (which, contrary to when I used to run a little more competitively in the late Nineties, is a rare indulgence nowadays). 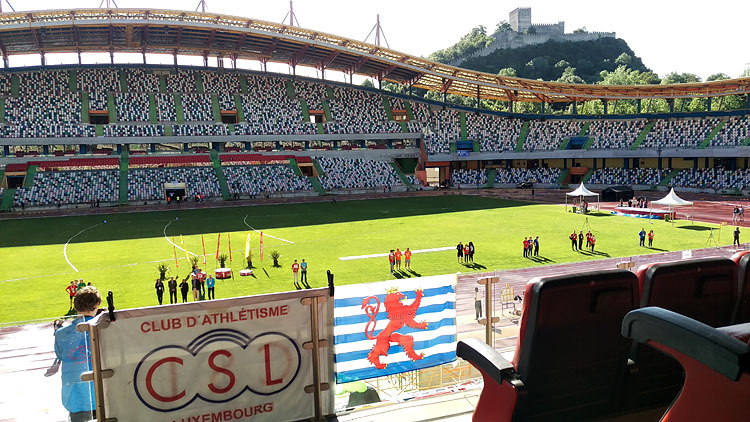 Since there’s a sizeable Luxembourgish team at this year’s event (nine people are signed up), we then headed to the outdoor track to catch Sandy Debra’s hammer throw competition. Afterwards, we still saw the tail end of the opening ceremony inside, and then it was finally time for me to warm up again. Once more, I started a little too early. With a call-room time of 20:20, I started running a little after 19:10, thankful to still have some daylight outside. Temperatures were still quite good, but there was once more quite a lot of wind that had a cold sting to it. I did my usual routine of stretching, skips and strides, but then as the temperatures dropped decided to head inside to do the remainder of my routine in sprint spikes. Once inside, there was noticeably less traffic (obviously, since the 60m heats in the different age categories draw a lot more people than the half-finals). I was able to get in a few good strides, but also spent a good time recovering in between. All of us entered the call-room at about the specified time (20:20), again with minimal fuss. The inside of the call-room was much emptier too, and before too long the first of the two half-finals were called up to head out onto the track. I was in the second half-final, so I had a few more minutes, and then got called up first since I would be in lane one. 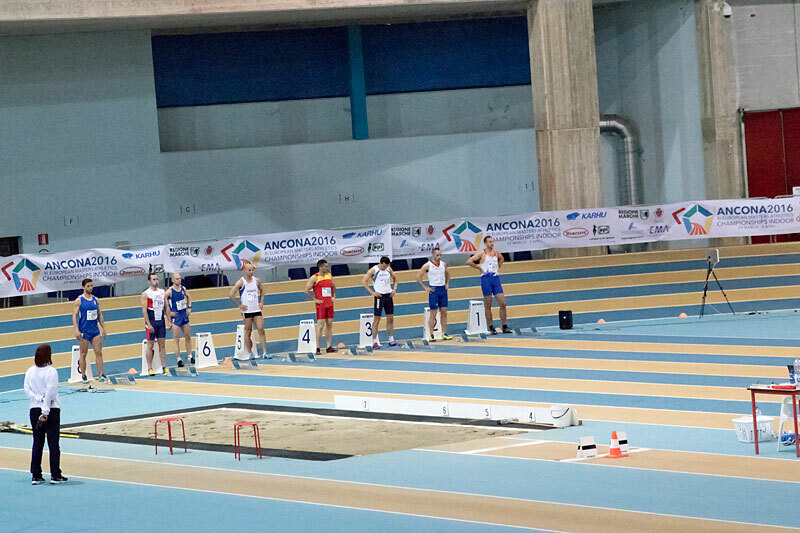 I set up my starting block in the full knowledge that I would be in no position to influence the outcome of the race. My time was the second-slowest in my heat. The challenge therefore would be to do the best that was still possible after the long day. 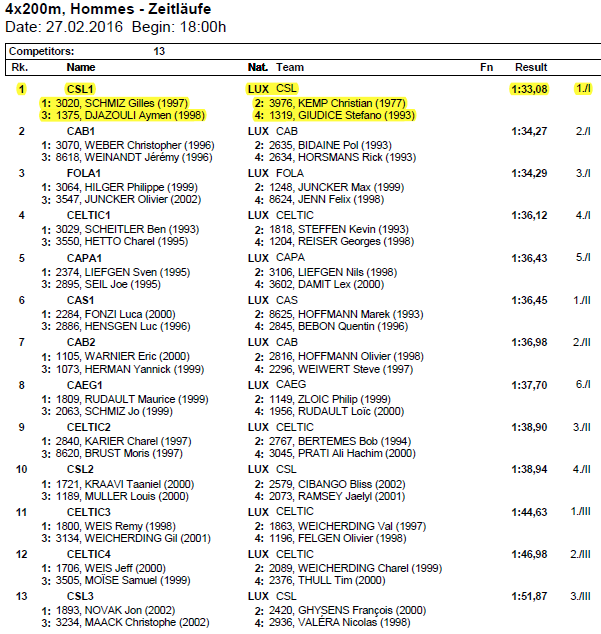 Privately, I’d set myself the goal to compete only with the athlete in lane two, Guillaume Tessier, who had been a tenth of a second faster than me in the series. As the gun went off, I was surprised to actually be ahead of him – typically, when competing at a national or regional level I tend to be one of the slowest starters. However, this was short-lived, he caught up with me pretty fast and I could do nothing but hold on and try not to let the advance get too big. Meanwhile, the guys in the middle lanes were in a different league. 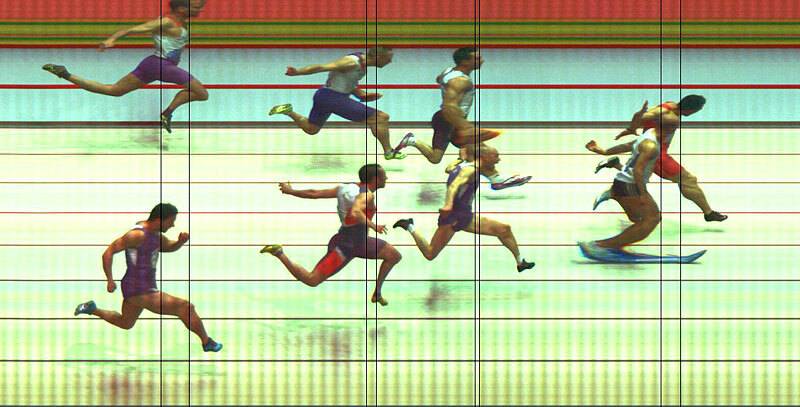 The heat was won by Sergio Cruz Pastor in 7”01. 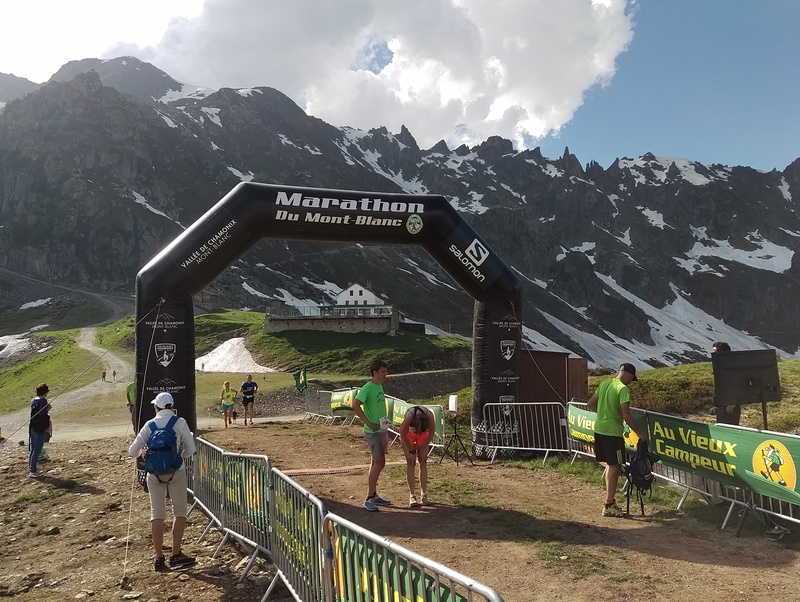 I had one weak moment a few meters before the finish line, which almost felt like I mis-stepped with my left foot, and crossed the finish line in 7th position in 7”42, just 2/100 in front of 8th place. In total, I was in 13th position, which of course meant this was the end of the line for me. Obviously only the eight first runners go on to the finals. 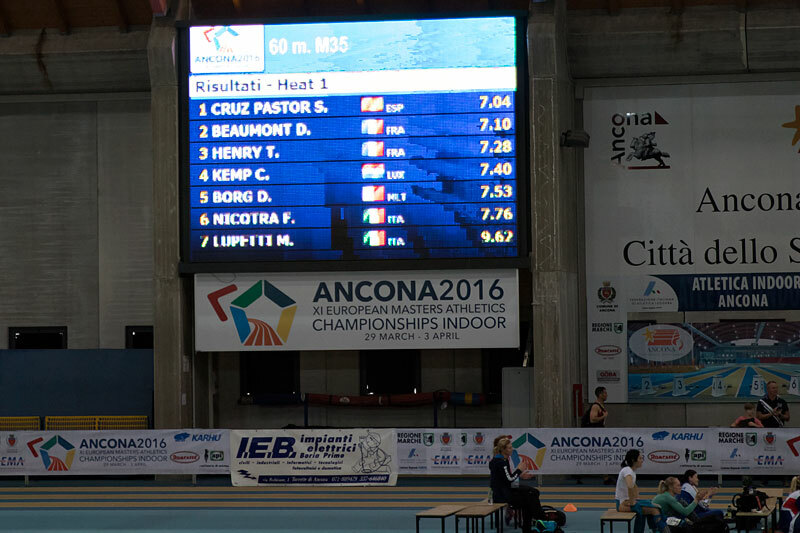 My half-final was two hundredths of a second slower than my time in the heats. I would have liked to still improve my time, but considering all the things that lead up to this competition (injury, illness, etc.) I’m happy to have run the times that I did. Both times were actually better than my previous season best (7″50), and while I’m 4 tenths of a second slower than my all-time PR of 7″00, I’m sure that most of my competitors are also a sizeable margin behind their own bests. 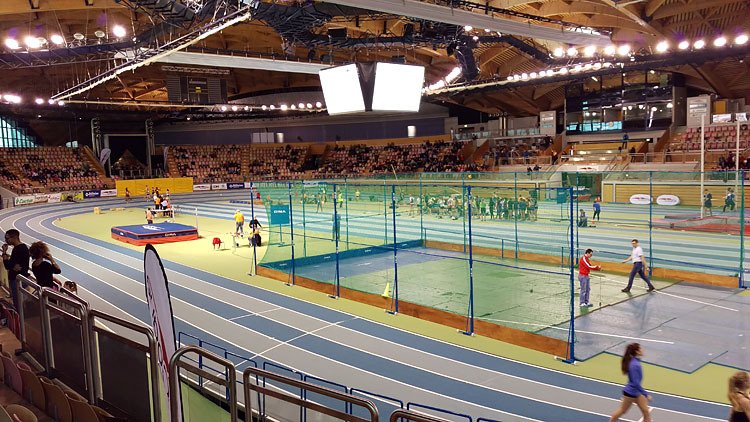 I did my final indoor meeting for 2015/2016 on Luxembourgish soil this past Saturday, over one month after the Luxembourgish Championships. Athletes in the national team were afforded two more opportunities to compete in between, but the rest of us had to make do with regular training or travel abroad to compete. I chose the former, getting a few solid training sessions in during February. 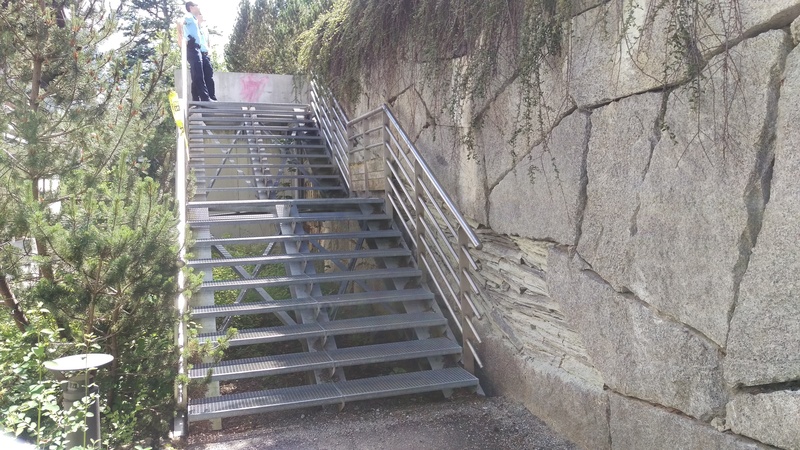 I did no tapering at all for this weekend, with a particularly hard stairs training on Monday that left my calves shattered for the rest of the week. So did 5 weeks improve my performances? Yes and no. My first race for the day was the 200m. I warmed up for it with a 2km loop outside, then headed back inside for stretching, skips and strides. The warm-up area seemed deserted, since a lot of the top competitors in the 2016 season had decided not to race. This allowed me to be seeded in the first heat, which is always a good thing because it gives you access to the running lanes fifteen minutes before the race start (as opposed to only being allowed onto the race track shortly before your start, after the previous heats have run). I was put in lane 4, which is pretty much optimal for me in my current shape because while it might be marginally slower than lanes 5 and 6, it is also less extreme and puts two runners ahead of me who I can make it my task to catch. Catching the runners ahead of me worked… 50%. While I did catch up with Quentin Bebon in lane five somewhere at the start of the second turn, Philippe Hilger remained safely in the lead for the entirety of the race. I had a better than average start and did a solid first turn, but fell apart again in the final 30 meters or so; which meant I was forcing too much and not running with an optimal technique. I crossed the finish line in second place, in 23″49, and a considerable distance from the winning time (22″82). More surprising was that overall, I also finished 2nd out of 13 runners. Also of note is that all of these guys were born in the late Nineties. Next up, after several hours of waiting, was the 4x200m relay. I’d talked myself into my club’s first team, a spot I thought was merited because of my 2016 performances. I had made an argument for our club’s strongest possible constellation to compete since I thought we’d have a chance of finishing on the podium, but did not really agree when one newspaper predicted us as the potential winners in their meet preview. 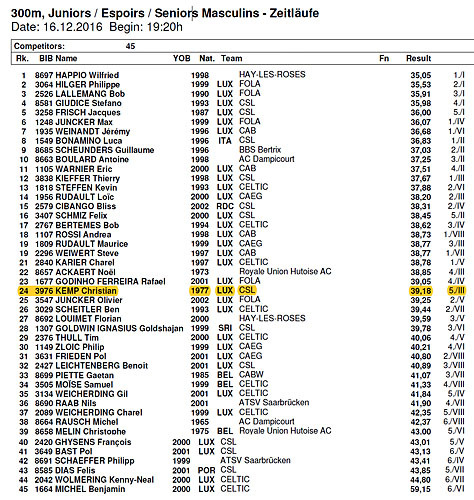 I thought that CAB with Pol Bidaine was a stronger contender, especially since most of their team was fresh whereas our relay had all competed in either the 200m (Gilles, me) or 400m (Stefano, Aymen) already. The gun went off with Gilles (slowest PR of the team) in first position. FOLA had their strongest runner in first position. 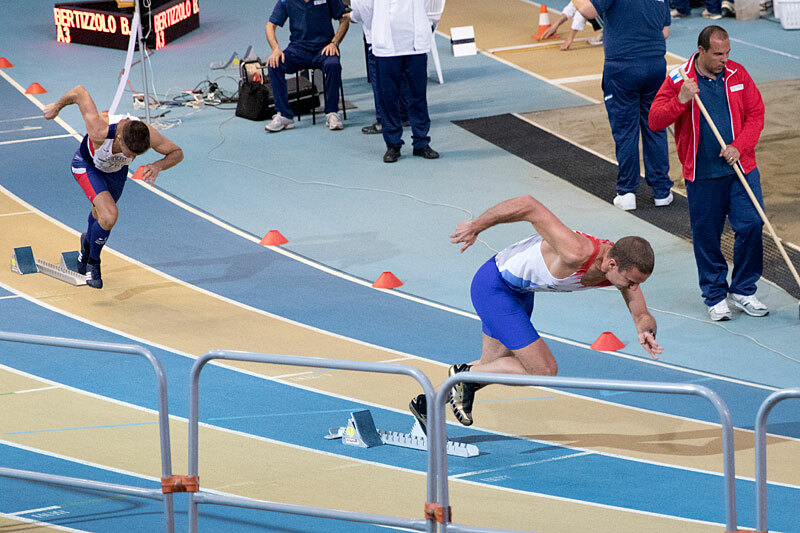 We were in lane 6, so the relay change from Gilles to me had the added complexity of him needing to fit between me in the inside of the lane and the barrier on the right side of the track. Our change went over without much drama, even though I probably started a little early and couldn’t push off at full speed until I had the relay baton in my hand. I did a fairly aggressive first turn during which I could see FOLA’s second runner in an inside lane blow past. He had less distance to run, so all I could do was push hard and hope for the best. After the turn, the runners all converge in lane one. With FOLA ahead, I was expecting CAB to not be far behind, but as I moved left I turned my head and couldn’t see anyone else. 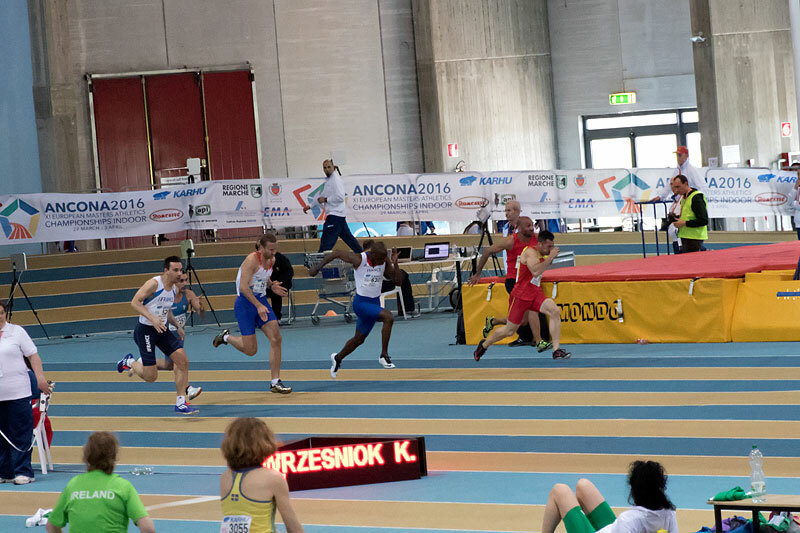 I was in second position then, which I held until the end of my relay. The relay change was a bit hairier this time. I came in at full speed, but all the lanes were blocked with waiting athletes. I had to brake aggressively, then was so close to our third runner, that I couldn’t hand over the baton straight away. We finally managed to do the change-over, and for a moment I was afraid I hadn’t safely handed over the baton, but he had a safe grip on it and was off. Aymen managed to catch FOLA’s third runner (born in 2002! 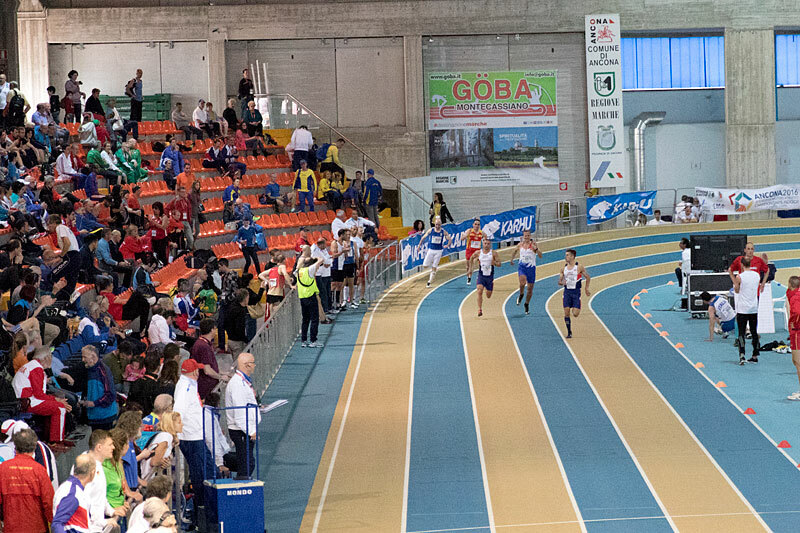 ), and Stefano solidified the lead to cross the finish line with over a second ahead of CAB who had moved up a position and finished marginally faster than FOLA. Overall, we did 1’33″08; which means as a team each one of us had an average of 23″27. Considering the constraints (all of us running on tired legs), this is an OK time. There have of course been faster championship wins, but also slower ones. 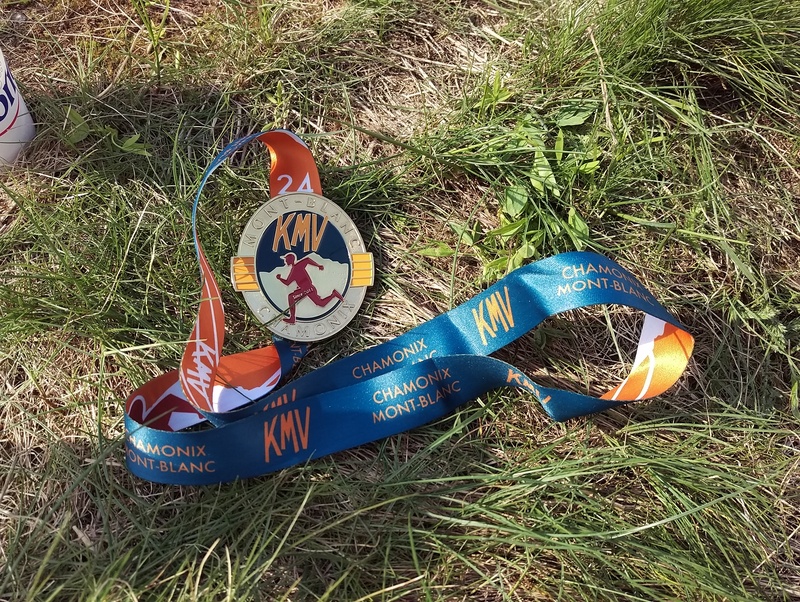 In closing, while I thought that five weeks of additional training should improve my season best by more than just one hundredth of a second (23″50 to 23″49), I’m still happy with the competition. 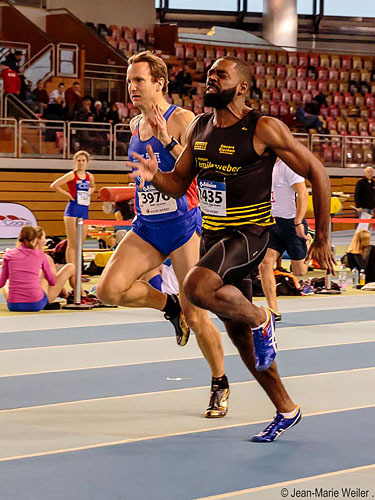 At 38 years, ten years after I officially put an end to my track&field career, and with more achilles injuries than toes on my feet, I can once again go out there and compete. 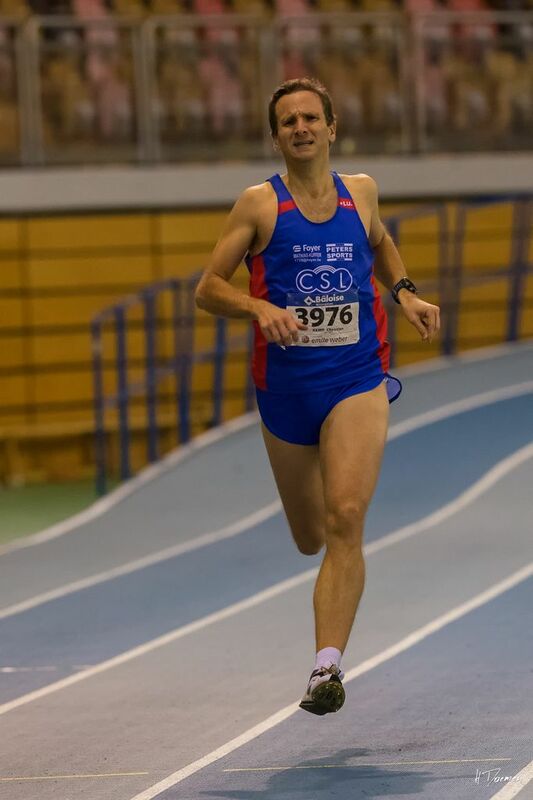 What’s more is that I can feel my body becoming more resilient again, because contrary to the last few competitions my achilles tendon was doing quite well the next Monday. 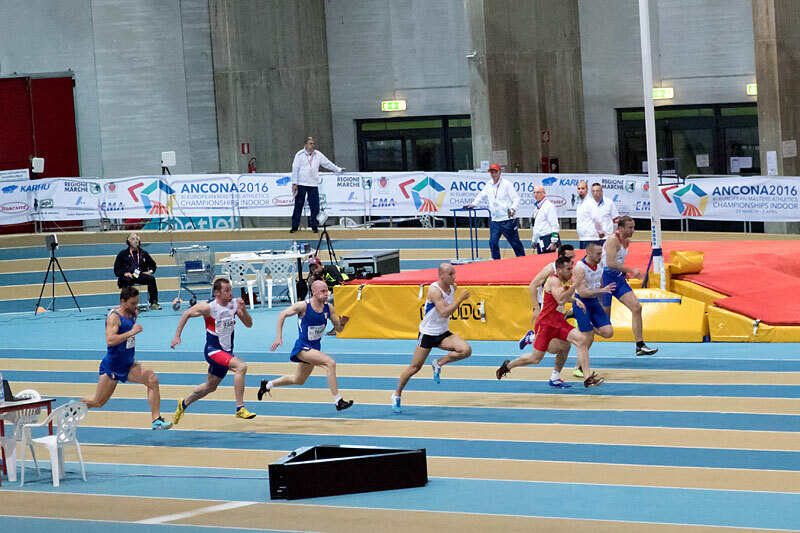 One month to go before my final indoor competition for this season, which will also be my first international competition in ten years (and first european championship ever): European Masters Athletics Championships Indoor in Ancona, Italy.